The successful live HD broadcasts from the great opera houses in movie theatres worldwide are bearing their fruits for the home video collector as well. 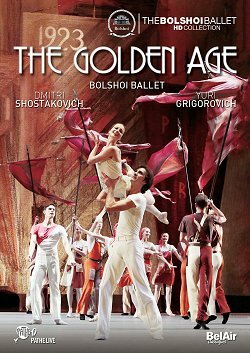 The ballet performances filmed at Moscow’s Bolshoi Theatre over the last three or four years are gradually appearing on Blu-ray and DVD. La Bayadère is the latest title in the “Bolshoi Ballet HD Collection”, managed by the independent Paris-based video label BelAir Classiques, a series which has been growing from strength to strength with every new release. Categories: Blu-ray and DVD reviews | Tags: ballet, ballet music, BelAir Classiques, Bolshoi Ballet, Bolshoi Ballet HD Collection, Bolshoi Theatre, classical ballet, La Bayadere, Ludwig Minkus, Marc Haegeman, Maria Alexandrova, Minkus, Svetlana Zakharova, Yuri Grigorovich | Permalink.